Indoor Warehouse Temperature Control - Rack Guard Netting, Dividers, Environment Temperature Control, Production Control, Storage. We can customize a temperature controlled enclosed area in your warehouse preventing heat and humidity from affecting your stored product. Custom doorways and viewing windows can be fabricated into the curtains. We can also create a retractable curtain system within 15 ft of your dock doors to isolate warm humid weather into a smaller area when loading or unloading trucks which will help cut down on air conditioning bills. 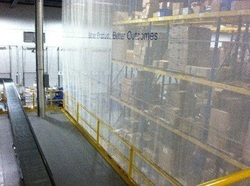 Let Midwest Netting Solutions customize a temperature controlled curtain system to meet your specific needs. .